This is the fifth post in a weekly series highlighting Italy’s four World Cup wins from qualifications to the finals. Read the fourth post here. Despite the ever darkening political climate that would lead to World War II the following year, France was ready to play host. Ten stadiums hosted the various matches: Stade du Fort Carré, Antibes; Stade Cavée Verte; Stade Victor Boucquey, Lille; Stade Vélodrome, Marseille; Parc des Princes, Paris; Stade Olympique de Colombes, Paris; Vélodrome Municipal, Reims, Stade de la Meinau, Strasbourg and Stade Chapou, Toulouse. The tournament would be played from June 4th -June 19th. 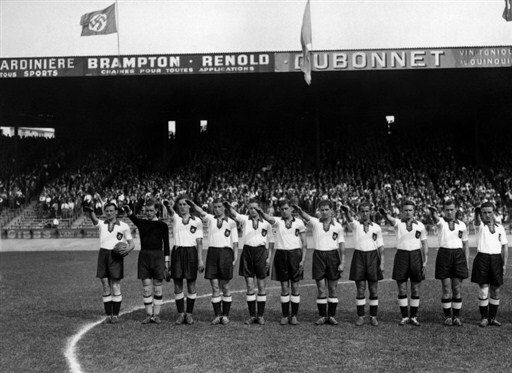 With the number of participating nations dropped from 16 to 15 due to Hitler’s annexation of Austria, the political climate threatened at times to overshadow the event, with anti-fascist protests accompanying the German and Italian teams. The other 13 teams included hosts France, Belgium, Czechoslovakia, Hungary, Netherlands, newcomers Norway and Poland, Romania, Sweden, Switzerland, Cuba, Brazil, and the Dutch East Indies. 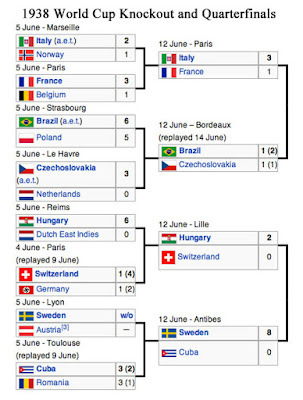 Of these teams, the seven seeded teams were France, Italy, Germany, Czechoslovakia, Hungary, Cuba, Brazil. This insured none of these teams would face one another in the first round. Sweden was the lucky team to have been earned a bye with the withdrawal of the former Austria. Germany vs. Switzerland would kick off the tournament on June 4th, while all of the other games of the first round would be played on June 5th. Things began well for Italy against Norway when Ferarri scored a goal just 2 minutes in to put the returning champions in front, 1-0. But Norway were not prepared to roll over. Their attempts included three shots that kissed the woodwork as well as a goal that was called back for offside. That is, until the 83rd minute, when Arne Brustad broke the spell and scored for Norway, making it tied at 1-1. With no more goals, regulation time ended in a draw, requiring 30 minutes of added extra time. 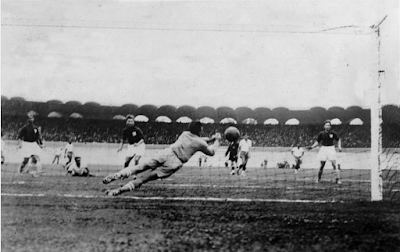 During extra time, a lucky deflection off of the Norwegian keeper rebounded toward the skilled sharpshooter Silvio Piola, who was able to tap it in for a final score of 2-1 for Italy, sending Norway home after their only World Cup match. 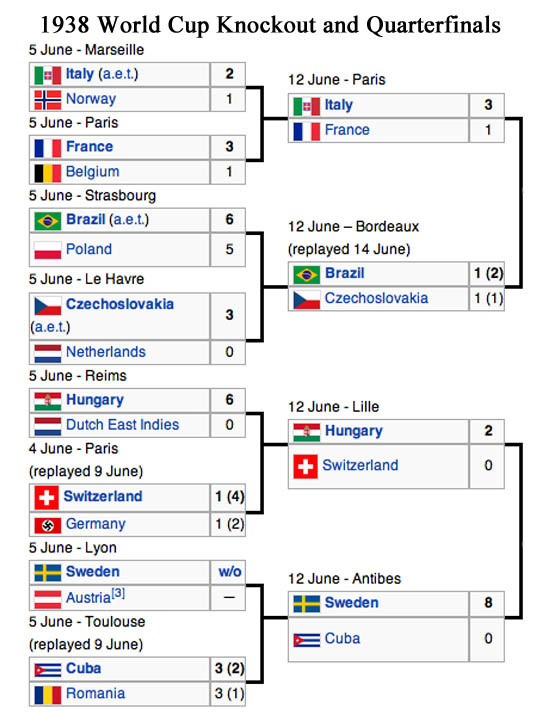 Interestingly enough, this was not the only first round game to go to overtime, all in all five of the seven initial matches went to added extra time, a testament to the competitiveness of the tournament. Of those five, two had to be replayed, this time at least five days later. Both replays turned out to be upsets, as Germany were sent home by Switzerland, the only time they’ve ever left the World Cup at this stage to this date. And the surprise Cubans sent Romania home as well. On June 12th, Italy would test fate by playing France, the host nation, in Paris. 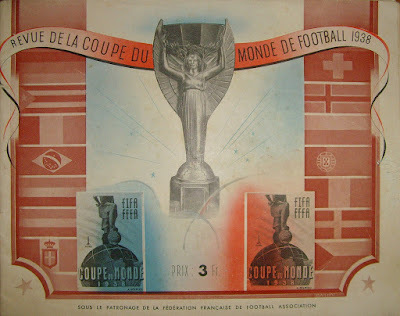 In the prior two tournaments, the host nation went on to win the tournament. So it truly was a win or go home scenario for Italy, with history going against them. However, I think Vittorio Pozzo and team were determined to challenge people who felt that their 1934 victory was luck or something less moral rather than talent and effort and determination. So, despite being jeered and mocked for offering Fascist salutes to the crowd before kickoff, and wearing black jerseys at the request of Mussolini as a Fascist statement, the Italians set out to prove the world wrong. Seven months prior to this match, France had held the reigning World Champions to a scoreless draw in a friendly, so they hoped to be able to improve on that match and dethrone the Italians. However after only 10 minutes, Colausi scored on a cross that the French keeper misjudged and actually became a goal. 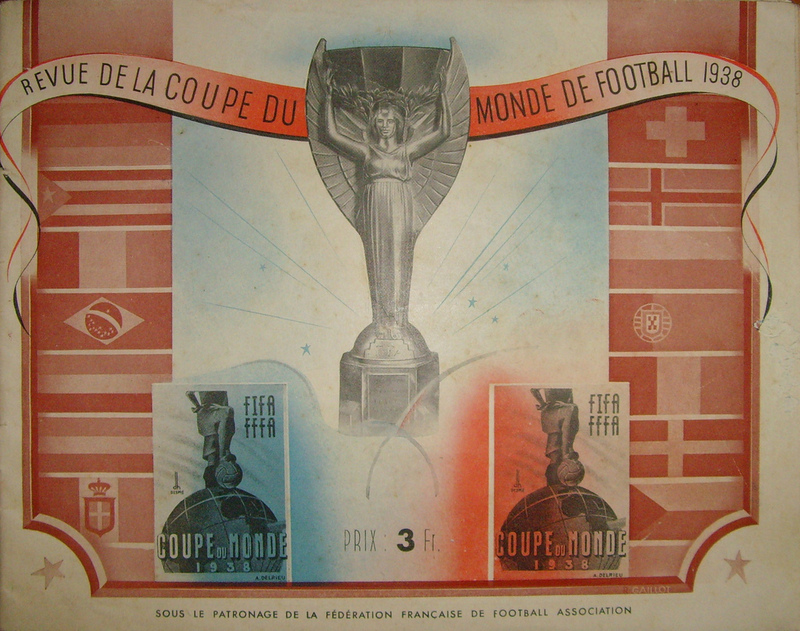 Within a minute, Oscar Heisserer of France scored an equalizer, but the second half would bring a different level of play. Pozzo lined up a more attacking team for the second half, and the French defense could no longer mark Piola, who scored in the 58th minute to put Italy ahead. France fought the good fight, but their inability to contain Piola would prove their undoing, as he headed in a second goal in the 78th minute to seal the host nation’s fate at a score of 3-1. In other quarterfinal matchups, Cuba paid dearly for their upset of Romania. Facing a well-rested Sweden, they were pummeled 8-0 by the Europeans, the only time a team has played only one match to reach the semifinals. Another matchup that saw two Czechoslovakians leave with broken bones and both teams finish 1-1 on nine men actually had to be replayed on June 14th, when Brazil took advantage of the Czech injuries and won 2-1. 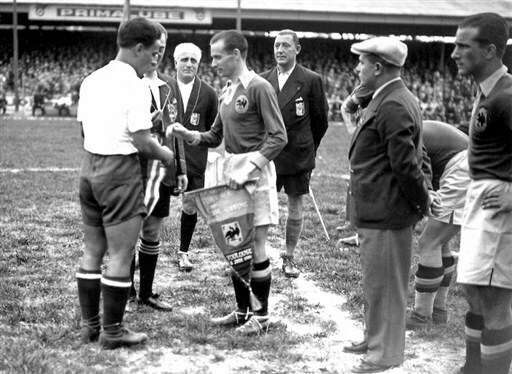 This would set up the first of many semifinals and finals with Brazil facing Italy. This is part five of a 12 week series I originally wrote for the now defunct Italy World Cup Blog five years ago. The series will now appear here weekly as a tribute to the Azzurri teams of the past.